On Saturday night, due to extreme exhaustion and a early morning tutorial near their house, I ended up staying with my parents. In fact it was just my Dad in the end as my Mum had a night shift at work. Usually when I have to stay at my parents’, I get a take-away. They aren’t exactly into cooking (for stories on my Mum’s cooking see this post from when I started the blog!) and I always find the lack of basic storecupboard ingredients a little offputting. However last night I thought that I’d brave it since I had some king prawns which wouldn’t last much longer. On the phone to Dad, he asked what I was going to cook. I said I’d be doing a prawn curry of some kind. Since Dad has recently started eating seafood again after many years as a veggie, he wanted to try some so I agreed to let him be my kitchen assistant for the evening. Firstly I asked him what he had at home that I could use. He seemed unsure of what to answer. So I asked more specific questions. “Do you have any natural yoghurt or cream? THIS is why I rarely let them cook for me. They think substituting cottage cheese for a yoghurt and cream curry base is a good idea! I thought I’d not risk asking him for anything else and emptied everything in my cupboards into a carrier bag before heading to Surrey. Due to a series of mishaps (inclusing Dad’s car breaking down), we didn’t get home until 10:30. So much for an early night then. I set about cooking a mughlai korma: a curry involving mild spices based on yoghurt, cream and almonds. Having Dad as a kitchen assistant is interesting. He has a tendency to tidy things away very quickly, usually before you’ve finished with them. Also, despite living for thirty years in the same house, he has NO idea where anything is. I decided to avoid the unidentifiable green objects and went looking for a grinder to grind some almonds. You would not believe what we found. I would have taken a picture but Dad was too embarrassed to let me. Literally this grinder was covered in about 6 years of fungal growth. It was hideous! Dad ran off to disinfect it. Meanwhile I found a pestle and mortar and completed the curry. Essentially, I made the curry by frying onion with a bay leaf, ground cinnamon, garam masala, crushed ginger and garlic then stirring in a mixture of natural yoghurt and saffron. Ground almonds, cumin, chopped coriander and double cream are stirred in and finally the prawns are added and heated through. 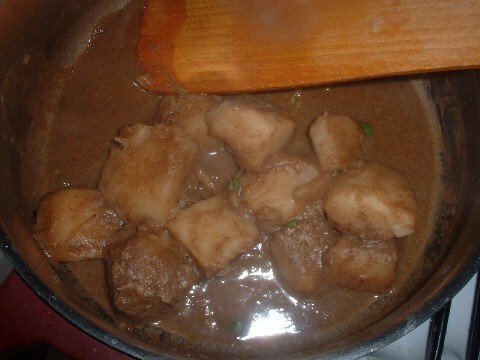 We tried to make a breadfruit curry too but that became a case of too many cooks spoiling the broth. I like plenty of gravy with my curries but Dad apparently doesn’t. I put my usual amount of curry powder in with the breadfruit but when Dad took over he only added about half the water and coconut milk that I would have done. The breadfruit ended up a bit overspiced. The prawn curry turned out very well. It is a lovely creamy curry and the spices lend a delicate flavour. I made caraway seed rice to go with it too. And finally, here are recipes. King Prawn Muglai Korma, and my version of Breadfruit Curry. Oh! I can TOTALLY feel for you with adventures in the parents kitchen!! My mother has been giving us “care packages” lately (because of the 2 mortgages we’re paying)… and just about EVERYTHING she has given us has been expired! O_O We went over there a few weeks back to have dinner and I was helping out… asked for a tomato.. and my step-dad pulls out this sad squishy sliced tomato from the fridge… complete with white fuzzy bits… I laughed at him.. and he looked at me.. dead serious.. and said.. “its still alright.. we can just cut those bits off”….. Yes! Catch the baking bug!!! Amanda - when you say biscuits, do you mean the things we Brits call biscuits (i.e. cookies) or those savoury scone type things? I’ve only ever had those once - when I was 10 and on holiday in Florida! LOL Not sure you get them over here. I like the idea of making cookies though. Double chocolate chip. Mmmm! Lea - My parents are the total opposite- sort of. They’re totally food hygiene obsessed. So everything in the kitchen is fresh but any meat gets cremated before being served - if it’s not black on the outside, it isn’t safe! They are totally ‘eat to live but not enjoy’ sorts.